Okay, so sometimes it's not a big deal if I wipe out a card or two along the way, but THIS time I have a theme going on here.....and it's the seasons and there are four of them and I would LIKE to keep it that way....I would hate to wipe out fall or something because it would make a big difference in where I am going with this post. 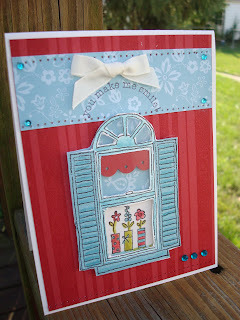 These four cards were all made with an adorable set called Window Dressing which is a hostess only set and worth hostessing a workshop for, just to get this set. There are just some sets that make you feel like a kid again and THIS is one of them. Okay, so here to your left you see Spring. Spring is such a hopeful time, with winters drab colors just "springing" to life, buds on trees, daffodils and tulips sprouting up all over, and warm breezes that make you want to just let the sun shine in. When I think of spring I think of one of those first days when you want to throw open your windows and just let the outside come in. Life is like this too, there are seasons. Keith and I keep saying that if spring is a newborn baby we are like in fall. YIKES!! EVENTS are also like this- vacations are like this, times in your life are like this, they have a distinct season. Our daughter Jen and her husband Davis and their two precious girls moved in with us in the end of June before heading to The Congo in mid-November. Ahhhhh, those first fews weeks of having them in our house were like the "spring" of our visit. You could think to yourself, FOUR WHOLE MONTHS OF HAVING THESE PRECIOUS PEOPLE UNDER OUR ROOF....and precious they are. :) Tovah, who is 4 has been saying since she got here that she wants to be a veterinarian when she grows up. The other day we were pulling her down the street with Lami her little sister in a big red wagon at night, (did you catch that - the other day at night? It actually was one of the many nighttime walks we have taken since they got here - the whole fam) AND, Tovah says out of the blue, "Gramma, I have made a decision," followed by, "Lami I have made a decision" and then she announced that she wasn't going to be a vet anymore, but she was going to be a dentist so she could live near ME, and if she was a vet she would live to far away and wouldn't get to see me," to which I replied with a huge lump in my throat, "But Tovah, you could be a vet and still live in Ohio" and she said, "But Gramma, where are all the animals??" I pointed to Luca, our beloved golden who also goes on our nightly walks with us and she said, "But where are the horses and cows?" I could write a book with the cute things they say......see why I want it to be spring forever??? Okay, so then it came to be about mid August and I was like wow, this is the summer of their visit, still plenty of time left for visiting but we are beginning to notice that Lami even talks a whole lot more then she did when they first got here......my favorite line for quoting from Lami was one time when I was letting her jump off the furniture in our family room (hey ~ what are grandmothers for??) and she said, Gramma, I donna yump aden, oday??? about 40 times after each jump until I was laughing so hard I could not stand it!! Here is my summer card, - things are still bright and cheery in mid August,,,,time is going by but look, it's not even half up yet, relax... there will still be lots of fun things going on between now and mid-November, right? Jen and Davis bought a house one road over during this time to rent out and maybe live in after The Congo for a while, I am about 95% convinced that their careers will always involve missions, but even if they just live there for a little while, how awesome will that be? The house as I mentioned in my last post is only one road away, perfect for little grand daughters to come and visit!! And it means that they might stay a while longer after the 2 year stint in The Congo.....LORD WILLING. Okay, so now we are moving on into September, but we still have plenty of time....and the about mid September it starts to hit me, yikes, we are getting really close to fall... before you know it it will be WINTER and time for them to head to the Congo.....and I start remembering the unexplicable sadness that overtook me when they left the last time but for the most part I chase it away, and think, there will be time to grieve after they are gone, right now, let me enjoy every single minute of this precious time and not spend ANY TIME wallowing in sadness when I still have them to enjoy!! This is when you approach fall.....(kind of again like when you turn 50 and say goodbye to your youth......completely.......like 40 I still felt young. :) and really I still do now but the mirror is starting to tell me something else) Last week we took the girls to the Tea House, and Michelle Zindorf met us there, it was a celebration for Jen's BD, which is October 3rd. It was so so fun, Jen, Bekah, Tovah, Lami, Michelle and I eating at that wonderful tea house, sharing desserts and then I told Lami and Tovah we could go to the gift shop and they could pick out a Boyds Bear.....Tovah picked out a Boyds horse, the homeliest silliest looking thing I have ever seen but she loves that guy, so much.....too cute. Lami picked out some little animals - a cow, a bear, a cat and a dog. All dressed up in clothes of course. Just the right size for Little Lami. Okay, so it's fall now and fall is fleeting fast, yikes it is almost WINTER..... Yesterday was my son's birthday, (my baby is now 26 - if that don't make ya feel old nothing will) and it was also exactly ONE MONTH till they leave.......but me and my feelings, we aren't going there until we have to. 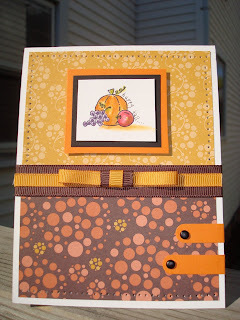 This is my fall card - and my favorite of these four cards. Fall is actually my favorite time of year, but I married my best friend and the love of my life in the fall, we had two kids in the fall, I just always love that hunker down feeling of fall, crisp apples, crunchy under your feet pretty leaves, warm sweatshirts, Thanksgiving......I LOVE fall, but right about now I am wishing it was spring again and we could start this visit all over again, like instant replay......yeh, that would be the bomb. Well, there is no denying that winter is on it's way. In life, ah yes, it makes me think of my mom and step mom who are in the winter of their lives and wish I could move them out here and settle them near me......it's hard to be so far away from so many people you love. It makes me want to spend the holidays with my kids, which may or may not happen this year, we just arent' sure with Keith's job and all. And it makes me want to hold onto Jen and Davis and Tovah and Lami and have it stay spring forever. But the seasons come and the seasons go......I have to grab back on to Mary Englebreits saying, "Don't cry cuz it's over, smile cuz it happened" and hold on for dear life cuz it's almost cryin time again. But guess what? They will return in 2 years and everytime I drive by or walk by that little white house one street over I am going to imagine them in it......Tovah will be 6, and Lami will be Tovah's age. And they will be as cute as ever. I can tell now I am gonna need to talk to my Layla girl right after they leave. Last time it helped so much to hear her adorable little voice on the phone saying " I love you Gramma" - like sav on a wound. Okay, now I'm crying so I'm gonna stop this nonsense and get upstairs and go enjoy this gorgeous FALL day........and anticipate the next visit instead of worrying this one away. 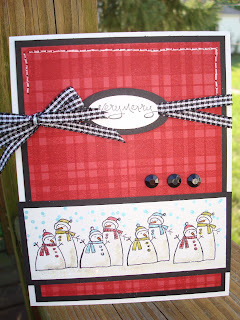 And so here is my final card, and so far so bloomin good I have not wiped anything out.......did you all notice my blog banner? It's new, and I had it made, and I am so happy with it that sometimes I just sit and stare at it and listen to James Taylor. I'm all done crying now and going upstairs to see what's on the agenda for today......maybe the Cincinnatti Zoo, or maybe another bike ride, the possibilities are endless!! I was babysitting for them last night and had to give Lami her first "time out" from me - talk about killer, she had to say she was sorry before she could get up and once she called me over and said through tears, "Gramma, I got a yittle booty" which was a little boogie........and I lost it - she is such a pistol, I wish you could all spend 15 minutes with each of them and then you would see why between Layla, Lami and Tovah, when they go home it will always be "cryin time again" even though I would never hold them back!! Because right after that the anticipation of the NEXT VISIT follows and everyone knows - anticipation is half the fun!! :) :) :) Sometimes it's the best part!! Happy Saturday everyone - go hug the ones you love - thats what I'm about to do!!! ( and as you can see, I have no idea how to put this signature thingey where I want it - just pretend I meant to do that, it's out there somewhere but at least all four cards are still here!! :) SMILE. We could so be sisters! I can relate to everything in your blog today. I even got weepy with you. Grandchildren are the best. I got to spend all day with my adorable grandson. I was one happy Grandma Not to make you green, but they just live down the alley and through the church yard. I am so blessed. And Oct 3rd is one terrific day for Birthdays. My father turned 82 on the 3rd and DH turned 52 on the 3rd !!!! Isn't that too cool? My two best guys sharing a birthday. ALSO I LOVE FALL, it is the perfect season. Enjoy every day, no worries, keep smiling *and* if you need any excuse to give those precious grand daughters another hug... Give them one from me. p.p.s. I was able to figure out this blog thingy, I think! I love the 4 season cards and enjoyed your chat,too! Oh Karen, remind me not to read your blog when I have to go somewhere...I'm crying MY eyes out! Miss you here in Jersey, your friend, Allison S.
One of my friends who also loves your blog as do I told me Karen posted a new one! Oh Yea I thought I can not wait to read it! I adore your post! I am a writer myself, (well not professionally but I love to write) So when someone posts a long personal post as yours was it is like candy for me! It is so awesome reading about your gradkids and your family! Praise God that there are wonderful people dedicated totally to his works that are able and willing to sacrifice the way they do for him! I did get teary reading about the time you have with them. I personally guess I am in the spring of my life as a parent, but every day I know how fast Winter will come, and I just treasure every second of Spring, Summer, and Fall to come! I wish it could be Spring with my little one always, and always! God has a plan though and I must allow it to happen I just need to treasure what I have now and have had for the last 6 1/2 years with my oldest! Your Tova reminds me so much of my Willow she totally says things like the Vetrinary comment all the time. She started picking out favorite Words a few months ago and she uses them all the time. Her first word was Sensibility. she just loved that word and used it all the time. Today she said I have a new word mom and I said what is it, She said well it is Pumpernickle now I might have miss spelled that, but anyway Tova sure reminds me of Willow! Enjoy your sweet ones! Thanks for sharing your life and your cards with us! Hi Karen! I got a call from Debbie Grayson and she mentioned that you and she had a few moments to visit with each other at convention. Just wanted to say "hi"! Hope you're doing well. Love the pics of your grand daughter! She is adorable! I'm a grandmama too! Isn't it great! I would love to catch up! Hey Karen! Layla and I were reading your blog and looking at your picture. Everytime I go to your page she says, "UH! GRANDMA!!" She loves looking at your picture and listening to your music. I just wanted to let you know Mike and I will be bringing Layla to you this Christmas...If you'll have us! I know that doesn't make it any easier to say goodbye to the girls, but at least you know one of your grandkids will be on there way to "Grandmother's house." I wished we could have spent some more time with Jen, Davis and the girls. I'm so glad that they have that house right next to you for when they come back home! I loved all your cards! 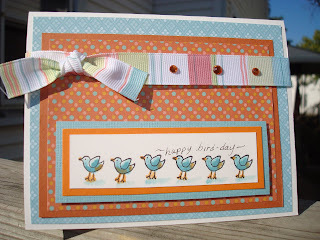 The fall card is my favorite, of coarse! Layla and I say goodnight! We Love you and Miss you! Call ANYTIME you need to talk to Layla for a good "pick me up!" She's REALLY good at putting a smile on your face! Talk to you soon! amazing cards you got here !!!! !so pleasing to the eye !!!! !ttfs:)love four seasons concept.